erratic but the sheared-off band may jam the mechanism or may become caught in the barrel in such a way as to create a dangerous condition. A slightly greater eccentricity can be really disastrous. The projectile enters the barrel at a very high velocity and if it encounters any positive interference as it does so, it may tend to twist and batter itself within the barrel. The possible consequences of such an occurrence, particularly with H. E. ammunition and a chamber pressure in the order of 60,000 pounds per square inch, are not pleasant to contemplate. rately parallel and all lie precisely on a true circlc of a definite diameter. The angular spacing of the chambers around this circle must also be held accurately. The cylinder must be mounted on an axle which must also be concentric with the circle and the bearings in which the axle turns must permit no side play or runout. The bearings must be located in the frame so that the chambers will line up accurately with barrel bore. If the barrel is screwed into the frame, the concentricity of the bore and the threads must also be held. The fact that the tolerances on all of these dimensions arc directly cumulative makes it very difficult to achieve the required alignment between the barrel and cylinder. The foregoing points are only concerned with the machining and mounting of the rotary chamber mechanism in relation to the barrel. An even more complicated chain of dimensions may be involved in the indexing mechanism and some of the tolerances 011 these dimensions will accumulate with the tolerances on the dimensions previously mentioned. Although modern manufacturing methods permit very accurate control of dimensions, extremely close control is expensive. It can be seen that even with very small tolerances, the specified 0.005-inch concentricity between the chambers and the barrel is really an exacting requirement. No matter how accurately a revolver machine gun may be built, the problem of alignment does not end when the weapon is at last completely assembled. 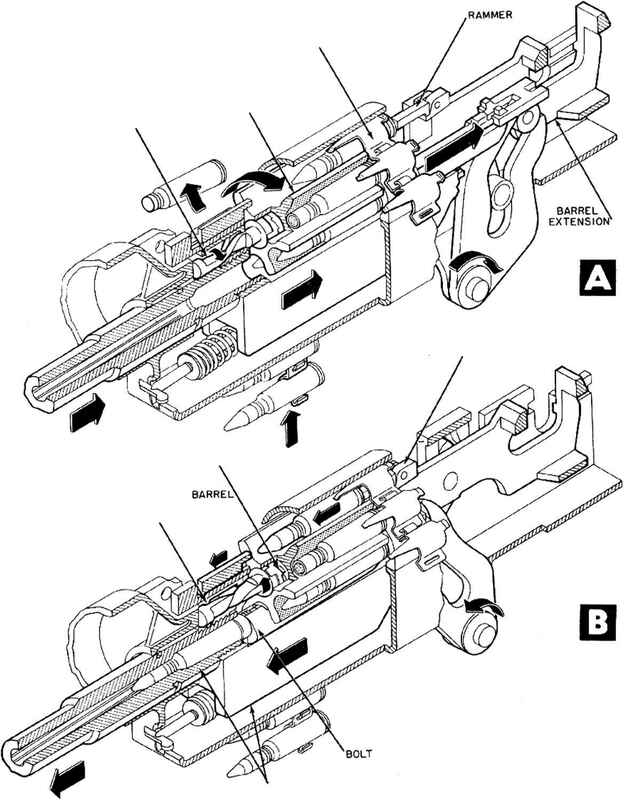 Even if the dimensions have been con trolled so that the cylinder can be indexed to bring each chambcr into alignment with the barrel within the tolerance, there is no assurance that this will still occur when the weapon is burst fired at high cyclic rates. In a high-powered weapon fired at a high rate, the entire gun structure and the mechanism are subjected to very large forces and dynamic disturbances which can cause considerable elastic deformations in the parts. Vibrations, thermal expansion, and other influences can all contribute to dimensional changes which can upset the alignment achieved with the gun in the static condition. To make matters worse, the occurrence of even a small amount of normal wear at certain critical points can quickly destroy the usefulness of the weapon. pendent on the simple factor of alignment between the chambers and the barrel. This alignment is so difficult to achieve and maintain that the development. of rotary chamber mechanisms has been slowed down very seriously. It is possible that this problem may be solved by the development of some device which will provide a direct and positive means for bringing the chamber into alignment with the barrel. It also may be that the fundamental difficulty should be sidestepped completely by using a mechanism which moves the round forward so that the projectile enters the barrel before firing.